"Beauty is in the eye of the beholder" is common phrase most girls have probably heard in their tweens or adolescents. It means that beauty is subjective. Different people find different things beautiful. But what about yourself? It is amazing the amount of people that see little beauty in themselves. I believe it is fine to have something about yourself you want to work on. But wanting to look like someone else, in my opinion, is not a health habit. Wishing to have a body like someone else is a self-hating tactic. The more you wish to have the weight, bust line, waist, hips, etc. of someone else the more you hate your own body. This can lead to self-abuse both verbally and physically. 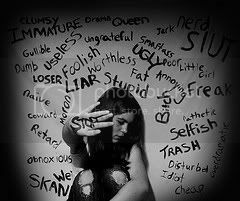 Sometimes we are the worst bullies to ourselves than anyone else can be. If someone were to verbalize some of the thoughts that women have toward themselves there would be serious consequences. Verbal abuse is not tolerated at my work place. If someone were to call someone a loser fat*ss they would be fired. Stop the abuse. Everyone has a unique body. I am not perfect, but neither is anyone else. I do not like my weigh so I have made a goal to lose the unwanted weight. However, I would never want to be as thin as an Asian model. While I do find them beautiful, I am happy being me. If I spend my time trying to be like someone else who will be me? I've spent this month trying products that would help my physical body. This last week of September I will focus not only on helping my appearance but also the thoughts toward myself. Starting with what I love about myself. ❤ determined to finish goals I set for myself. When was the last time you said you loved yourself? ManaStarre: I am honored that you would want to feature something of mine on your blog! I do not mind at all. And thank you for visiting my blog. I read your's frequently. Lavenrose: Thank you! I am pleased to hear that. :) I debate with myself sometimes if I should make these kinds of posts.